meditate until he reached enlightenment. from anxiety caused by self-centredness. In the 6th century B.C three great teachers appeared on Earth, unaware of each other: Gautama Buddha, who taught his disciples at Benares in India about the time Isaiah was prophesying among the Jews in Babylon and Heraclitus was carrying on his speculative enquiries into the nature of things at Ephesus. Gautama is perhaps the most well known and by far the most enlightening. Thus when Kash's father read in the local newspaper that the Buddhist community in Montreal would be celebrating Shri Buddha's 2538th birthday, he wanted to send greetings. Since Kash was meditating with Him daily, it was out of reverence and respect that the Awakened One be greeted on this blessed day. Kash's father had great respect and admiration for the Dharma and Consciousness Gautama Buddha inspired fellow humans to achieve. The least he could do to show gratitude and adoration would be to send a simple birthday greeting. Kash agreed and went within himself into the Thousand-Petalled Lotus. The Kundalini (Nectar of Immortality) rose from his Mooladhara Chakra and rushed through the Sushumna Nadi, bursting through the Celestial Clouds of the Great Lotus Forest. He hovered above the semi-circle of the Primordial Beings already assembled, and then slowly floated down towards his spiritual body that was meditating beside the Great Adi Shakti. His corporeal body merged into his spiritual Self, fitting into it perfectly from head to toe. Kash, now in the ethereal form of the spirit, got up to greet Shri Mataji Nirmala Devi, The Mother of all Buddhas. The Everlasting Light shone ever so brightly above Her as She sat in Bliss and Joy on the Golden Throne. After bowing to Her and all the rest, he asked for permission to see Shri Amitabha. Shri Mataji smiled and gave Her approval. Kash looked around the gaps in the semi-circle for a pair of hands, but there were none. 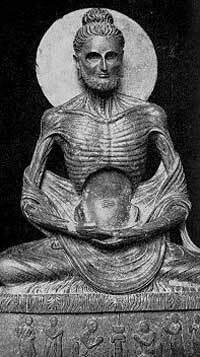 For some reason Shri Amitabha was completely invisible, even His hands. So how was he going to figure out where the Great Soul was sitting? The Divine Unity of the Spirit World were checking this child out! His outstretched hands began decoding the distinctive Spiritual Energy that was radiating from these ancient Immortals. His fingertips acted like a spiritual scanner, extracting readings from the All-Pervading Paramchaitanya, and instantly converting it into infallible information. At a certain gap Kash felt the distinguishing vibrations of Shri Gautama Buddha and walked to that particular vacant space in the semicircle. Shri Hanuman and Shri Ganesha were sitting on either side of this opening. He bowed down to the invisible Enlightened One sitting in between and extended the birthday greetings. The Enlightened One bowed back and Kash could feel the Spiritual Energy (vibrations) moving down slowly, first down and then up again. He knew that the Awakened One had just bowed down and returned his greetings, even though there was only empty space before him! When the song ended the Divine Beings started singing another birthday song for Shri Amitabha, but this time in Sanskrit. After it was over all of them bowed down to Shri Buddha, and He bowed back in return. After it was over Kash stood up and asked for leave from Shri Nirvana-sukha-dayini Devi. He again wished all the Divine Beings seated in a semi-circle around the Great Adi Shakti. He then closed his spiritual eyes and descended through the clouds, back to this material world of endless sufferings and ceaseless rebirths. Nirvana-sukha-dayini (390th): Giver of the bliss of liberation — grants Her devotees the unequaled bliss of moksa. Self-Realization through Kundalini awakening is an in-built evolutionary blueprint for the human species, a spiritual germination that can be verified and felt on the central nervous system. It is a living, evolutionary process to metamorphose Homo sapiens into Homo spiritus. ● Can we honor all religions? ● Deepak Chopra: Is Jesus Coming Back? ● Where is the Counselor residing? ● Confucius: Where does a man derive power? ● The meaning of "Truth"
● Self-realization: What is it? ● What is Kundalini power? ● Who Is Deepak Chopra's "Third Jesus"?